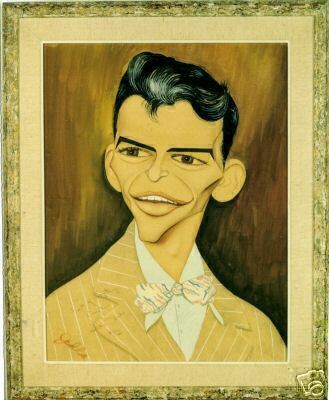 This page is for a very unusual Sinatra collectable. At a charity auction,Times Square, NYC. 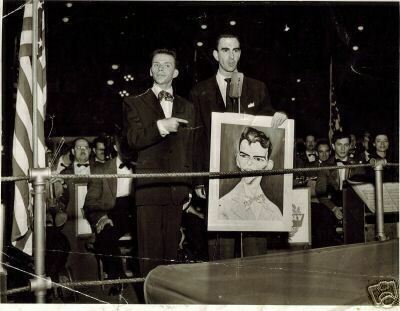 Frank auctioned off and signed the front of this portrait of himself. All the information and the photo documention are included with this, sure to be the hi-lite of your collection. The night of the auction this piece sold for $4,000 to the lucky highest bidder. The winner was in the restaurant business, and was from Sweden.Thats where this painting has been since the early 50's. Over 50 years abroad. I have brought it back to the US where it belongs. Frank was the auctioneer that night. He autographed it for the lucky winner! Important note, the autograph was NOT personalised to anyone...SCROLL DOWN TO VIEW SIGNATURE. SOLD!!!!!!!!!!!!!!!!!!!!!!!!!!!! !1THIS 17"X 23" WATERCOLOR, IS PROFESSIONALLY MATTED AND FRAMED (23"X 28")AND IS IN SPECTACULAR CONDITION FOR BEING 60 YEARS OLD! 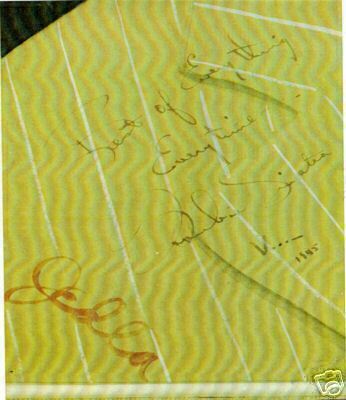 The greeting reads "BEST OF EVERYTHING, EVERYTIME, FRANK SINATRANOVEMBER 1945". 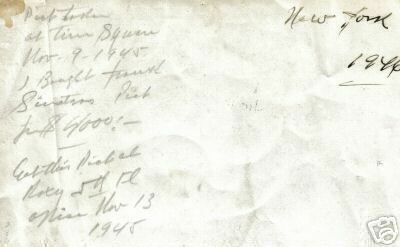 It is signed on the lower left side in fountain pen....IT DOESN'T GET MUCH BETTER THAN THIS!